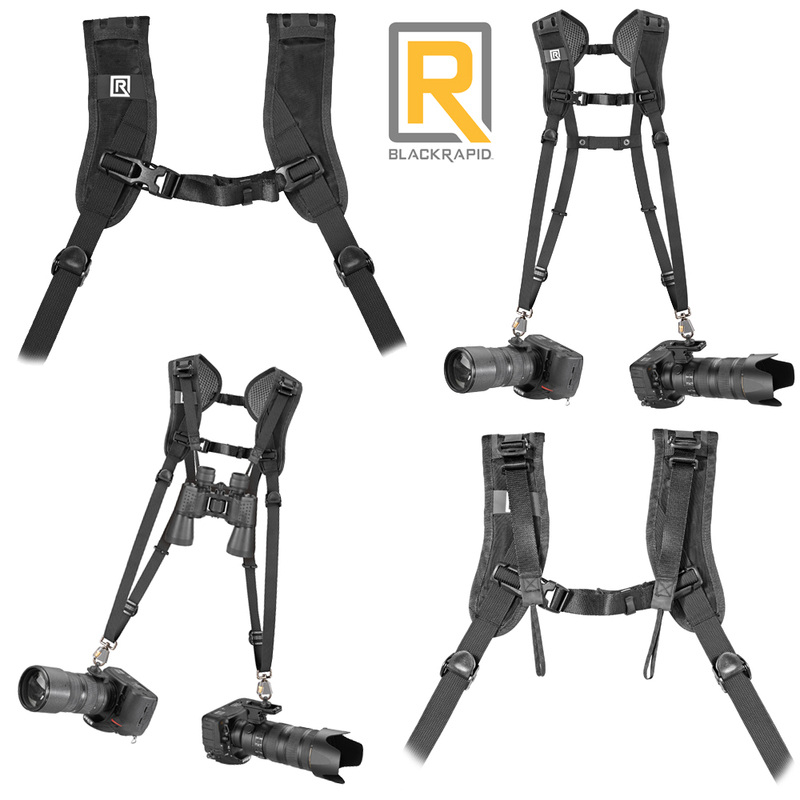 This BlackRapid Double Breathe Camera Harness accommodates two cameras by allowing them to hang from the right and left shoulders. The cameras can then rest upside-down along both the right and left hips so they can be quickly raised for use. 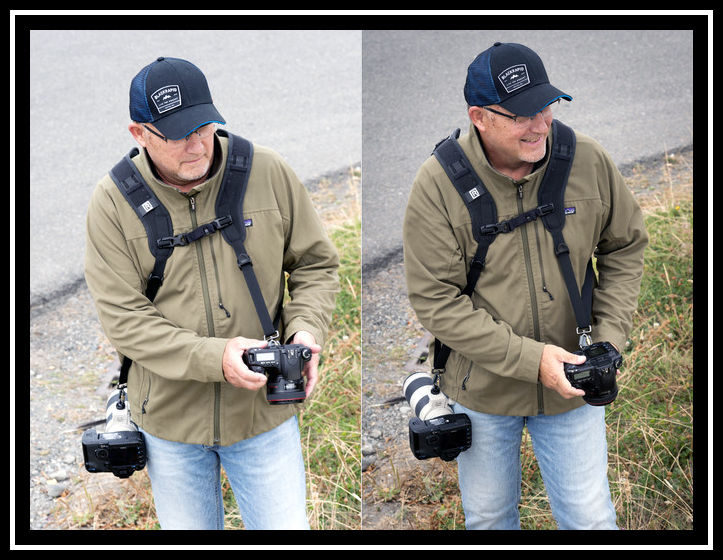 Even when connected to two large cameras with their attached lenses, the Double Breathe remains comfortable to wear due to its resilient and breathable mesh pads which cushion the back and shoulders. The pads' structure optimizes air circulation between the wearer and the harness, which works to remove and minimize perspiration in warm and hot environments. For those with a thin or small build, the Double Slim Breathe Camera Harness can be chosen for a better fit. To attach to a camera or a lens, both of the Double Breathe Camera Harness' webbings feature a durable, brass and zinc-alloy CR-3 ConnectR locking carabiner. Also provided is a BlackRapid FR-5 FastenR Breathe for every carabiner. Each FR-5 FastenR Breathe creates a connection point using a camera or lens's 1/4"-20 tripod mount and has a large, integrated D-ring for easy use with BlackRapid webbings that utilize a CR-3 ConnectR. The length of each webbing is adjustable from 36.0 to 63.0" and measures up to 1.0" wide. Spring-loaded bumper locks that can be slid up and down the length of the strap's webbings make it especially easy to limit excess camera movement when using the Double Breathe. Additionally, the webbings from a separately-available BlackRapid Binocular Breathe Strap can be connected to the front of this harness so that it can hold a binocular or a third camera against the wearer's chest. When only one camera needs to be carried, the Double Breathe's front sternum and rear stabilizing straps can be disconnected to create two individual cross-body camera straps. One strap can be worn across a right-handed user's body, draped from the left shoulder to the right hip, while the other can be worn across a left-handed user's body, draped from the right shoulder to the left hip. Either individual strap allows a connected camera to rest upside-down along the hip so it can be quickly raised for use. A nylon pouch is included for storage and transport, as well as two plastic BlackRapid Lockstar Breathe Carabiner Protectors, both of which are compatible with BlackRapid straps that feature a CR-3 ConnectR locking carabiner. By folding over a CR-3 ConnectR, a Lockstar Breathe prevents unintentional user contact with a CR-3 ConnectR that could cause it to accidentally unlock. Additionally, it helps to block the metal surface of a CR-3 ConnectR from scratching a connected camera or lens. Box Dimensions (LxWxH) 10.2 x 4.4 x 3.1"